Condition : Visually very good, fully working with newly fitted hard drive. Also included : Bulldog tour flight case with compartments for discs and extras, 60 x sound patch discs, a laminated ‘Devotional’ tour set list, operations manual & power supply cable. 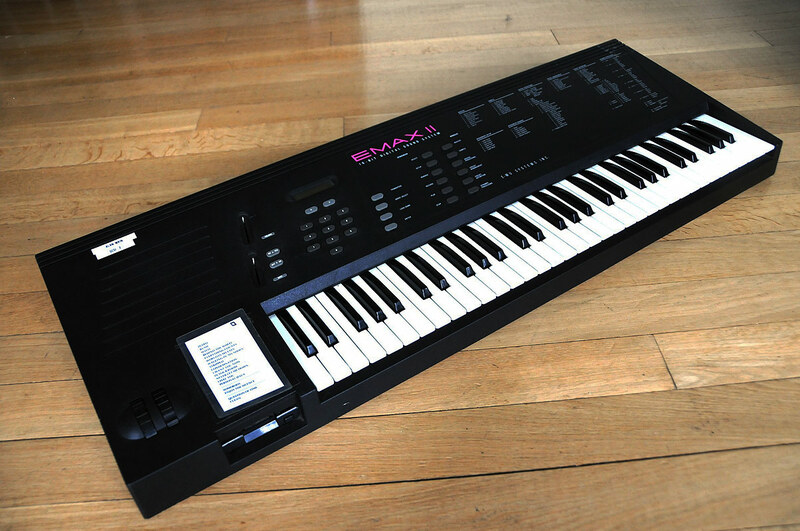 The Emax II 16-bit sampling keyboard from Emu Systems made its debut in 1989. The sweet musicality of the Emax II converters and its rich resonant filter are capable of producing not only vivid acoustic instrument emulations, but also exciting synth textures. Complemented by a powerful MIDI clockable arpeggiator; a 16-track sequencer, which although not suitable for studio applications could be useful for live sets; additive synthesis functions and rock solid reliability, it became clear that the Emax II had much to offer. It is attractively finished in textured black resin with a distinctive pink logo, grey legending and functions map, complemented by stylish, ergonomically raked parameter buttons and sliders. The 61-note, non-weighted, velocity-sensitive keyboard has a pleasant positive feel and features a choice of 14 velocity curves, but sadly is not pressure-sensitive (although the Emax II does respond to MIDI aftertouch control). Keyboard velocity can be set to control VCA level, VCA attack, VCF cutoff, VCF attack, and VCF Q — yes indeed, the Emax II filter has resonance! The two recessed performance wheels can be programmed for a variety of real-time and MIDI performance options, including control of pitch, filter cutoff, envelope attack rate, level, panning and LFO modulation types. Additional performance controllers are available via the rear-panel CV pedal insert and the two footswitches provide control of sustain, release, patch change, arpeggiator on/off, and sequencer start/stop. 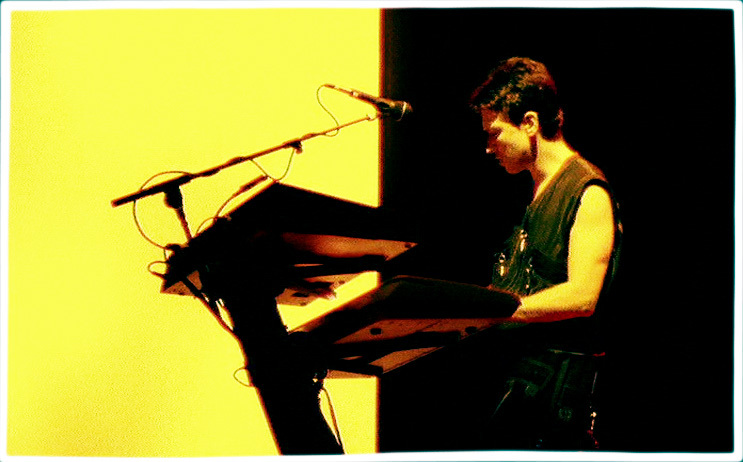 Also located on the rear panel are the MIDI In and combined Out/Thru connectors; Clock inserts; an RS422 computer interface; the stereo analogue sample input; a headphone socket; and the eight audio channel outputs, which are configured as stereo pairs each with assignable panning and a send and return loop for outboard processing. The small blue backlit LCD is used to access the parameter pages — the limited amount of information contained on each page inevitably necessitates lots of button-pushing, though fortunately the operating system (final revision 2.14) is easy to understand and has much in common with that used in the Proteus range. The built-in floppy drive reads both DD and HD disks, but because part of the operating system is written to disk during formatting, each floppy has a maximum sample data storage capacity of only 524,286 bytes (0.5Mb). Realistically, the only practical method of voice bank storage is to hard drive — an 8Mb Emax II bank spans 16 floppies and takes about eight minutes to load. Although the standard model does not ship with an internal SCSI hard drive, fitting one is a doddle as Emax II ships ready-wired and second-hand 150Mb drives can be bought for about £50 through computer magazines such as MicroMart. Additionally, the Emax II includes as standard a SCSI interface on the rear panel for simple connection to external devices such as hard drives, CD-ROM and Iomega Zip drives. Voice architecture : Banks consist of 100 Presets, which can only be saved or loaded as part of a Bank; and although Emax II does not recognise MIDI Bank Change messages, Banks can be loaded from hard disk via a simple consecutive program change routine. The timbral characteristics of each Preset are determined by the parameter settings in the Preset Management and Preset Definition menus, and every Preset can contain multiple samples each with individual performance characteristics such as keyrange, level, pan position, tuning, output assignment, and modulation response settings. Samples within Presets can be assigned velocity crossfade and velocity switching, and can be zoned or split with up to four samples triggered by a single keypress. The Emax II digital filters are utterly superb — listening to them, it is hard to believe they are not high quality analogue devices; they sound so rich, fat and warm — and of course, filter cutoff frequency and resonance (Q) can be modulated by velocity or assigned to respond to mod and pitch wheel movement. Each Preset has a lowpass filter (VCF) and VCA — both with 5-stage AHDSR envelope generators, an LFO with adjustable rate, delay, and speed variation, and may also be routed without loss of polyphony through the Chorus module. Sample editing at the Preset level is non-destructive and as long as the original source data is unchanged, samples can be virtually copied between Presets without consuming extra memory, just as virtual copies are created on a computer hard disk recording system. Editing the sample data at source level is the domain of the Emax II Digital Processing module, where we find facilities for determining the length of the sample; its loop points; plus basic cut, paste and combine; sample rate conversion; pitch-shift and also morphing (which creates an interpolated crossfade between two samples). Arpeggiator : The onboard arpeggiator is powerful and has many excellent features – it will output MIDI and 24 ppqn Clock messages with an internal tempo rate of between 40 and 240bpm to a resolution of .01bpm, and can alternatively be controlled externally, via MIDI or from devices such as older drum machines that transmit 24, 48, or 96 ppqn clock pulses. Six arpeggio patterns are available including random, and notes in the arpeggiated sequence can retain their original input velocities. The arpeggio can be modified so that its sequence is extended beyond its original range; two harmony parts may be added and the arpeggiator keyboard range is used to define the range of keys that triggers the arpeggiator. 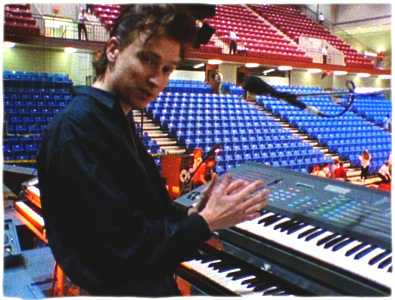 The factory Presets that shipped with the Emax II were of a uniformly high quality and were derived from the flagship Emulator III sound library. My special favourites are the grand piano, the arco strings, the woodwind, the solo cello, the soul and ooh choirs, the synth basses and the vintage keyboard sets. These voices are also found in the Proteus modules, but side-by-side comparison shows the quality of the Emax II voices to be superior to the data compressed Proteus equivalents. Several Emax II sample libraries are still available on CD-ROM, and a few samples can be downloaded from the Internet (see boxes for details). A degree of MIDI voice editing at Preset level is readily available from Steinberg Cubase, which includes a Mixer Map template for the Emax/Emax II. Sadly there is no PC sample editing software available, although this is possible on the Macintosh using Digidesign’s Sound Designer. Transform Multiplication starts with two samples which are merged, common frequencies are accentuated and the remainder are discarded; the process achieves its best results with harmonically rich sounds but is of limited appeal as results are unpredictable and the actual processing is very, very slow indeed — it takes around 40 minutes to process one second of material! Spectrum Synthesis is an additive synthesis method that again is time-consuming, but is capable of producing impressive results, as the Spectrum Synthesis factory voice set ably demonstrates. There are also a couple of useful diagnostic utilities offered by Emax II — the MIDI Activity monitor works in real time and analyses MIDI data transmitted and received, and provides message type and channel information; the Emax II Diagnostics are hidden away in the Master/Special 9 menu and are a bundle of SCSI hard disk, floppy drive, RAM and GRAM test routines; to access them you must first enter the code number 3629 (ie. E-M-A-X on a touch-tone phone!). Verdict : Emax II is a neglected classic instrument — the audiophile quality of its converters and its warm, rich filters give the voices a presence and musicality. 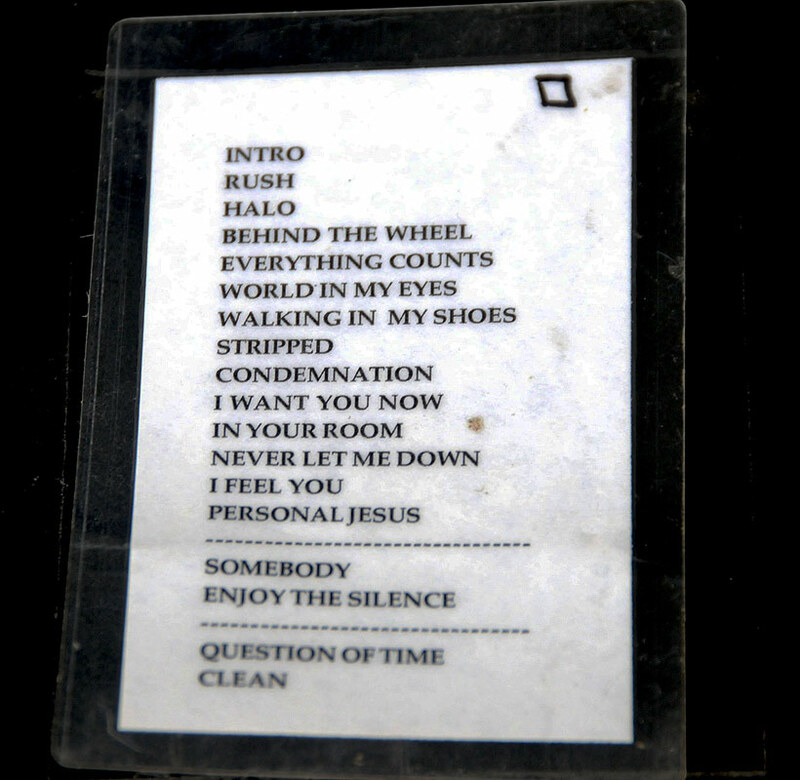 16-voice polyphonic, regardless of whether stereo or mono voices are played. 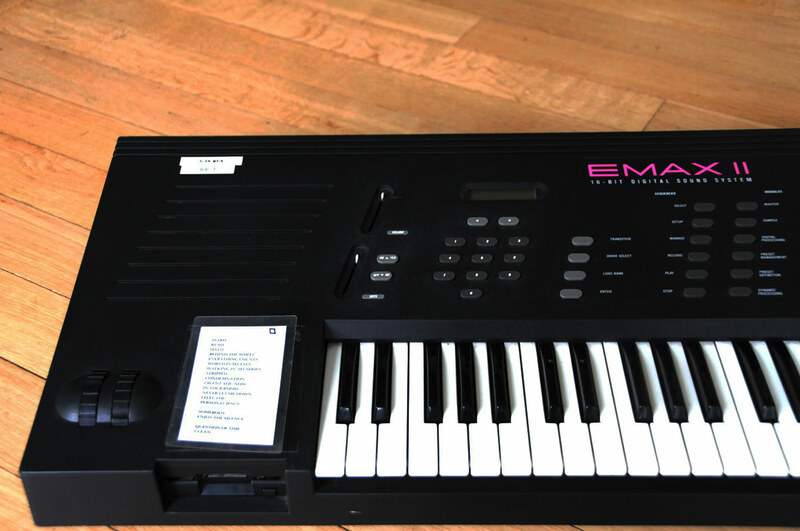 Each Preset can be assigned its own MIDI channel and the Emax II can also be used multitimbrally in ‘Supermode’. Internal processing is 32-bit, and sampling is via 16-bit linear DACs with 64x oversampling, with 18-bit DACs used for playback. Five sample rates are available: 20kHz, 22kHz, 28kHz, 31kHz, 39kHz, and Emax II will also play samples recorded at 44.1kHz. The 39kHz sample rate gives a frequency response of 20Hz — 18kHz and a standard 2Mb Emax II gives 13.4 seconds of stereo sampling (26.8 seconds mono); a fully expanded 8Mb instrument provides a respectable stereo sample time of 53.6 seconds (107.2 seconds mono). Signal-to-noise ratios are good, measuring greater than 90dB and 102 dB for input and output respectively, and harmonic distortion and noise (THD+N) is rated at below 0.05%. Additional discs : 60 x floppies containing many factory and self-made sounds (examples: Harp/Karplus Strings, Arco Strings, Rock Guitar, Grand Piano, Conga Set, Sitar, Fairlight moods, Electric bass, Brass, Woodwind, Choirs, Sound fx and many more).